Well, then – it’s October 2nd and I’m 2 days into going without any alcohol for a month. 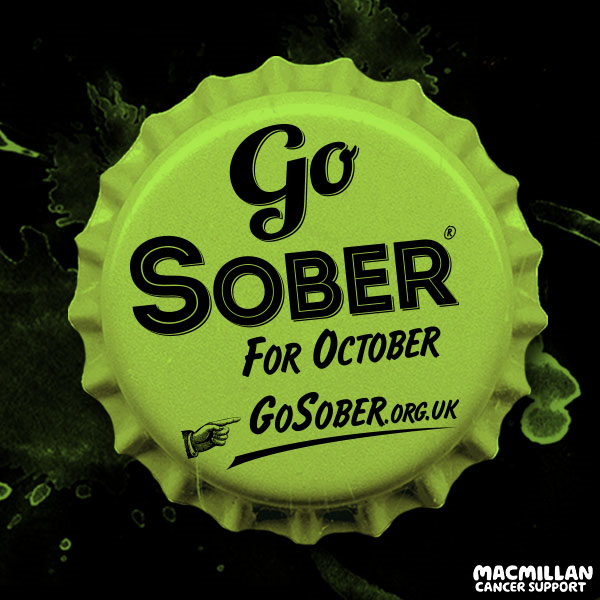 Yes, I’m doing ‘Go Sober’ for Macmillan. The house is an alcohol-free zone, save for a safely locked-away-for-Christmas bottle of Bailey’s which was on offer last week at our local supermarket. Here’s the thing – it hardly sounds hard, does it? I mean, compared to running a marathon, or walking the length of Britain, or such like. Not having a beer for a month. Easy? Yeah, right. The thing is, I like a beer. Or two. Or five. I mean, I’m not desperate for a pint when I wake up, but Saturday nights watching telly without a glass of Chardonnay or a bottle of Newcastle Brown? Well, they’re a perfect match. It becomes a habit. It’s a habit I’ve continued since the early 1990’s, and it’s not really doing me much good. I can’t deny that I’ve noticed a definite reaction to beer in recent years, so it has to stop. This is a great opportunity to start the process. And, Macmillan might make a few pounds out of it in the process. I have to say, I’m feeling rough as heck so far, which is actually a bit worrying. I’m hoping for an improvement. I’ll keep you updated. And if anyone has any advice on how not to replace the booze with sweets, crisps, or any other bad foodstuffs; please let me know. Right now, I’m craving Wine Gums. This entry was posted in blather and tagged alcohol, beer, go sober, macmillan, wine. Bookmark the permalink.